In 2007 Dolphin Field Investigator (DFI) Chris Becker, discovered in a Mamaroneck, NY boatyard, a green Dolphin with a wood house, an inboard and Setauket as her home port painted on her stern. On September 5, 2008 we had a major breakthrough. Chris saw her sailing near Larchmont, NY and she had the number 71 on her sails. He subsequently found out her owner was a member of Horseshoe Harbor Yacht Club in Larchmont and emailed me. I emailed the yacht club and asked if they had a member who owned a green Dolphin and the next day Charlie Drew emailed me he was the guy! Charlie has not raced Arion but he has sailed her** (see below) numerous times to Block Island, the Vineyard, Newport, Shelter Island and Montauk. He also sailed her on the Hudson River keeping her in Newport Marina in Jersey City for a couple of seasons, and one season at the 79th street boat basin in NYC. He thinks she has her original spruce mast which is fitted with lovely old brass fittings. He bought her from Mark Disanti in 1987 and her name then was Arion. Arion was once Yankee, the first Dolphin built in 1964/65 by John Shumaker the founder of Yankee Yachts. 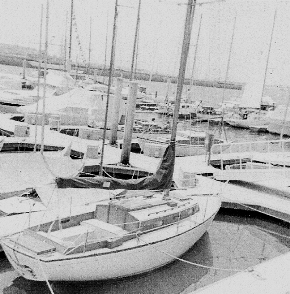 She was built on a bare hull made by O'Day and shipped to southern California in 1964. In the several conversations your webmaster has had with John over the past 18 months he inevitably asks if we had ever come across his old Yankee - all he knew was that it had been shipped east. I am really looking forward to telling him we found her. Thanks so much for writing. Arion is indeed the boat built by Yankee Yachts in the early 1960s. The hull is green now--and has been for as long as I can remember. We have owned her for over 18 years. I just spent a huge amount of money to have her entire deck replaced by Taylor and Snediker in Paucatuck. I find it hard to keep up with the woodwork, but keep pressing on as best as I can. We sail her all the time. On September 19, 2008 we got the following email and some wonderful pictures of Arion from Charlie. We'll get more of Arion's/Yankee's story soon. I just took some pictures of Arion. They are attached. Please use whatever suits. I am delighted about this web site. Many thanks for getting in touch. The decks had developed some leaking a dry rot, particularly around through deck fittings, port and starboard shrouds especially, but also sections of the deck where glass laminate was beginning to come up from the plywood--by one of the starboard scuppers and on the port quarter. In 2006 - 2007 I had the house, cockpit and lazarette cover lifted off and the entire deck demolished. New deck (w dynel I believe), new toe rails, glassed cockpit, new frame around lazarette hatch. As to the house itself, the original turtle had started to go. They replaced the top of the turtle and then glassed it over (not nearly as handsome, but now dry). The rest of the house is mahogany, I believe, and original, as far as I know. One of the portside ports had developed a leak, which they attended to. A good bit of the bracing along the hull where the deck attaches was bad and got replaced. Above right is a Yanmar 1 GM 10 diesel. The old gas engine was replaced in the early 90's when the cooling jacket started to disintergrate. During the recent renovation the engine was pulled, thoroughly gone over and reseated with a new exhaust system. May 11, 2012. Dolphin Field Investigators never sleep, and some never forget a name. A few days ago, senior DFI Doug Berg (Black Dolphin), tipped us off to an article that appeared in the Oak Cliff Sailing Center Newletter In brief, this involved a rescue during a race with winds blowing 20-30 knots. A lifeline broke and 2 crew went overboard - not wearing life jackets! A nearby Farr 40 skillfully executed a rescue, turned the two crew over to a RIB, and continued racing. Its a great story, especially given the recent headlines on west coast racing tragedies. (Click here to go to the newsletter). Yes, I am the Mark DiSanti that sold Charlie Arion. We bought the boat in 1983 from a gentleman out of Locust Valley, New York. We raced and sailed her all over the western Long Island Sound, with numerous overnights to Oyster Bay, Northport and American Yacht Club. On vacations we would cruise nonstop from Sea Cliff Yacht club, our home port, to Shelter Island, Sag Harbor, Block Island and Newport. She was set up with a mast head spinnaker and had a good inventory of racing sails. Arion was a dream to sail as most S&S yachts are and never had a problem when the wind and sea would show its face. As the years went on Arion was getting a little tight for our family [my first daughter went sailing on her when she was 2 weeks old] and at the end of the summer of 1987 we sold her to Charlie and bought a S&S Northstar 38 which we still own today. I will try and dig up some photos of Arion and email them to you. Good to hear from you and thanks for your continuing interest. 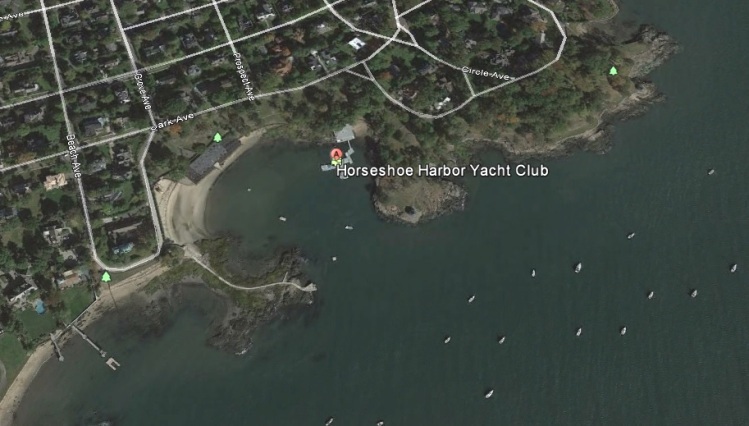 I continue to enjoy Arion immensely, sailing as much as four times weekly during the summer season out of Horseshoe Harbor Yacht Club in Larchmont. Since I last reported I have made a number of repairs and replacements, including the following. (1) replaced the dodger and sail cover; (2) replaced the lifelines: (3) replaced the fuel tank (the original finally gave out depositing a load of diesel fuel in the bilge-- A shop called Luther's near Newport RI custom made me a new aluminum one); (4) repaired the toe rail in two small spots: and (5) replaced the boom. The boom story is interesting. It have way under the load of snow last winter. It was of beautiful hollow wooden design, made like an old barrel with 6 "staves" each running the full length and angled at the edges so as to fit together and produce a round design. I fortunately found a master wood worker in Cold Spring on the Hudson who made the new one following the same pattern. October 6, 2016. We have been working on bronze winches on early Yankees (click here to check that out) and wanted to find out what #71 had for winches. We got the following reply and quick Arion update from Charlie. I don't think I have the original winches, alas. Mine are Lewmars. Had a great summer with lots of day sailing. Haven't cruised for ages. But may return to it once I retire in June 2017. I was cruising around the website doing webmaster work and came across this quote from your last email to me. "Had a great summer with lots of day sailing. Haven't cruised for ages. But may return to it once I retire in June 2017"
Have been doing your reading assignments? Make sure you check out http://dolphin24.org/ccc2017.html. I am recruiting a Dolphin to represent NY state - you don't even have to race if you don't want but it would be great if you did. The last part of your comment caught my eye. #71 is a special boat and having her in Camden for this event would add a lot. And a great way to start off retirement! Thanks very much for telling me about it. It would be great fun -- but It is hard to see how I could make it back from Camden in time for a vacation departure time. Please do feel free to keep me in the loop. Same old story with Arion. Bit the bullet and installed a roller furling headsail this summer -- had my #2 Genoa retrofitted. Everything else status quo. Planning to stay for my retirement in the NYC area so that I can keep sailing out of Larchmont. Might even do some cruising. I will keep Camden in mind. The roller furling headsail has been wonderful, enabling me to single handle Arion frequently in May and June before my curtailed summer. We discovered a leak in the centerboard trunk which I hope has been rectified (won't know for sure until she goes in next spring). While troubleshooting a leak in the cabin top we found that the mast step was very close to giving way and had that replaced. With the mast down this fall we had all the standing rigging checked and pronounced sound. We also repainted the topsides. All the wood on Arion makes her a pleasure to look at but also demands constant vigilance. Some cabin top leaks are proving very difficult to trace. My woodworker (so glad to have found one) recommends we completely glass over the upper edges of the cabin. A possible project for next spring. I have two questions and a report on Arion. Getting fired up about putting Arion in the water. I discovered quite by accident, while trying to find a leak in my cabin top, that my mast step was close to becoming detached from the deck. That is now firmly glassed in place. The other interesting development was finding a leak in the centerboard trunk which I got re-glassed when I pulled Arion out in the fall. Hopefully (but I am not certain), she will prove tight and dry when she goes in this spring.